Dogs love the snow. But the snow doesn’t necessarily love them. This is a good time to go over some safety tips for your K9 friend if they’re going to play in the snow. Before you go out, know your dog’s metabolism and whether it needs to wear a warming coat. Just like us, dogs generate heat when active. 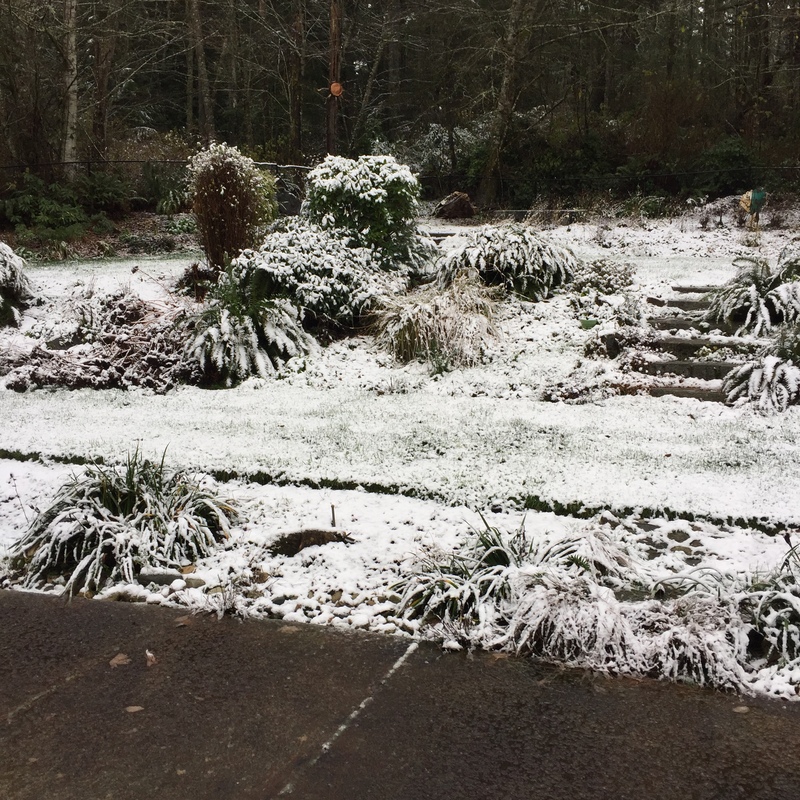 They might be fine playing in your yard and curling up in front of the fireplace later. But if you take them in the car, or under a canopy in your truck, you might need to put a coat on them when they go back in their kennel. You do transport in a kennel, right? While short-haired dogs can get cold, long-haired breeds need protection from ice balls building up in their coats. Golden retrievers, for example, have hair between their toes. An ice ball there can be excruciating to walk on, and can create a bit of front nip on the tissues. My beloved Magnum with his show dog coat would come out of the snow with ice balls up to…um…where we removed his other ones. Booties aren’t always the answer. They don’t cover the upper legs or chest and belly, and if your dog doesn’t routinely wear booties you’ll get to see an “ice dance” that would make Scott Hamilton take notice. There are several products you can spray on the dog to prevent the formation of ice balls. 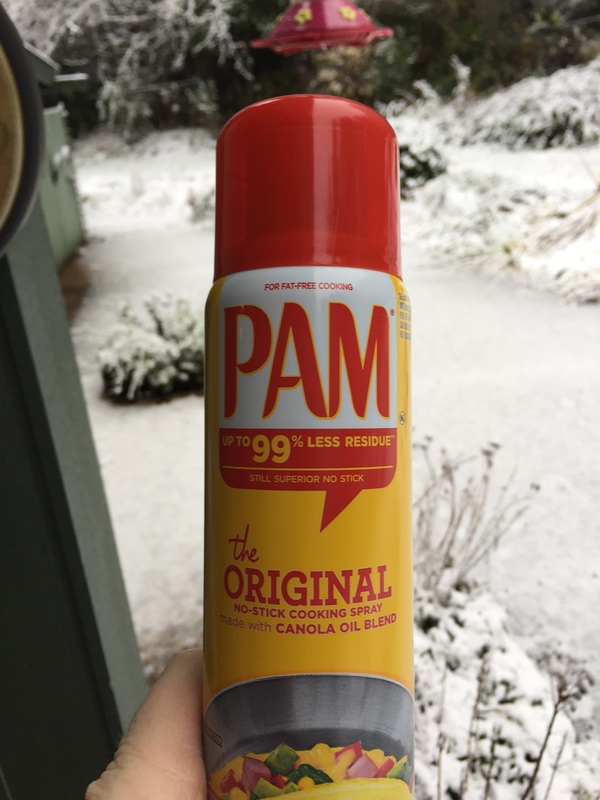 The one most everybody has at home is regular, original Pam. I haven’t tried butter flavored or “Pam for Grilling,” just the regular, original Pam. Spray it on their feet and legs, being sure to rub it between their toes. If the snow is deep and powdery, get it up in the “armpit” portion of their front legs and on the insides of their back legs. Those ice balls can become quite large and also create front nip if left in place. Periodically while out and definitely when you return to the warm, check your dog thoroughly for ice balls and break them up. If you want to go whole hog, there is a proprietary product called Musher’s Secret that is available on Amazon. It’s a cream that will remind you of petroleum jelly- BUT DON’T EVER USE A PETROLEUM PRODUCT! For those of you into horses, I’m told that Show Sheen also works, but I haven’t personally experimented with it. The next step is to keep your dog hydrated. Think of how much work it would be for you to bust through chest deep snow. Some snowy environments can actually be quite arid. Give them plenty of water and a bit of extra food is always in order, too. When not active, dogs use the food in their belly to generate heat to keep them warm. Finally, play smart! Retrievers or ball-driven dogs will love a loosely-packed snowball tossed to them. The key phrase there is “loosely-packed.” Don’t throw a chunk of ice to your dog to catch in their teeth. Limit play and don’t let them over-exert themselves in an exciting new environment. Then, with these few safety tips out of the way, get out and enjoy the snow with your K9 friend. They’ll have a good time, and you will too. P.S. If you have or plan to use your dog for Search and Rescue, make a game out of burying a favorite toy and letting them dig it out. As much as they tend to dig up our back yards, not all dogs understand that something can be “under” something else. Having them dig a toy out of the snow is a concept that will pay dividends later. They don’t need to search for it. Just let them watch you cover up their favorite toy and dig it out. Previous Article Home School Event!